1. Sauté coconut till the wetness disappears. Note: using fresh coconut. 2. Saute each dry fruit individually for a few minutes. 3. Mix coconut, dry fruits,and powdered sugar and keep aside. 4. In a bowl, add the flour, salt and ghee. Rub with your palm such that the dough appears like bread crumbs. Add just enough water to make a firm but smooth, soft dough. 5. Divide the dough into small balls. 6. Roll each ball with the rolling pin into a thin chappati or puri of approximately 3 to 3&1/2 inch diameter. 7. Place a tablespoon of the filling on one half of the rolled out dough. 8. Wet your finger and run it along the edges of the dough with water. 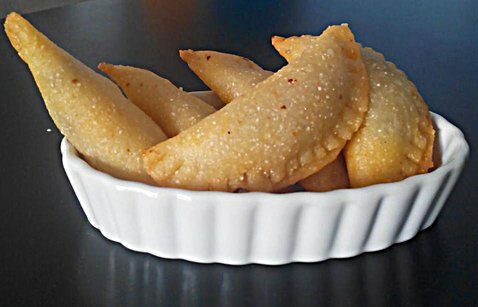 Fold the opposite end, enclosing the stuffing to form a semi circle shaped gujiya. 9. Press the ends firmly using a fork. 10. Heat oil in a deep vessel to deep fry the Gujiya. 11. When inserting the Gujiya the oil should be hot. Reduce the flame to medium or low and let the gujiya fry till the outside is light brown.